DoloMix is a natural painkiller that can quickly bring comfort and joint and muscle flexibility makes the horse more available to work. DoloMix is a synergy of 100% organic herbs, with anti-inflammatory painkillers. The purifying action is also important because it helps eliminate uric acid which clogs the joints. Your horse finds flexibility in his movements. This treatment can be used to prevent or relieve joint or muscle pain. It can be used in treatment of substance for a horse stiff or older. Ash has a purifying and anti-rheumatic action. It acts on the joint swelling. Willow relieves joint pain due to its derived salicylic (analgesics). The meadowsweet rich in flavonoids and salicylates has an anti-inflammatory and analgesic. Canada fleabane is used for its anti-inflammatory and diuretic. 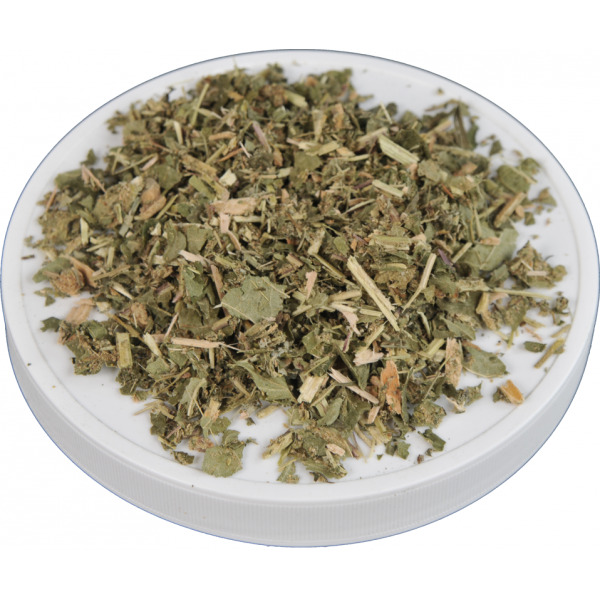 Nettle is rich in flavonoids, vitamins, iron and minerals has a remineralizing action and tonic. Birch diuretics and purifying properties, relieves rheumatic pain by promoting the elimination of uric acid and chlorides. These plants are all from organic farming. 3 measurements per day for a 500kg horse. In case of joint pain, 4 to 5 tablespoons for one week. Bucket of a kilo (one month of treatment).